This past weekend one of the retired priests was going to his "help out" (That's what you call it when religious priests without a parochial assignment assist at a parish with weekend Masses) and was curious to hear the promised "guest preacher." Unfortunately the guest preacher turned out to be a diocesan official who announced that the pastor--who had already disappeared--was under investigation for using the parish funds to support his gambling habit. So we have in our area another depressing story of the clergy getting caught while up to no good. How does this happen? How do we priests--who (presumably) teach and preach high ideals day after day--fall into these double lives and get caught in such sinful crimes? Do we need a reform of the clergy, as has happened at our moments in our Church's history? What's wrong with the Catholic priesthood, with all of its spiritual malaise and reports of low morale? 1. We don't say our prayers. Each of us, when we were ordained deacon (or subdeacon if it was before August 1972) promised to observe the Liturgy of the Hours faithfully on behalf of the Church and the world. It has not been my general impression that we take this promise very seriously. 2. We have allowed ourselves to absorb the bourgeois values of the North American upper middle class. 3. We have permitted the culture of the clergy to absorb the values and attitudes of certain decadent subcultures from the surrounding society. But, as I say, these are only IMAO, "In my arrogant opinion." Thomas, who had doubted, utters the most perfect Christian confession when he sees the Lord. My homily for this weekend is posted here. From time to time I try to read through the Constitutions of our Order. Of course I believe that my religious profession is of the Franciscan Rule, but along with Francis's Testament as a primary gloss, it's our Constitutions that are the authentic interpretation of the Rule for me. Each time I read through I find something new to appreciate. Today I read at the very end that our life is supposed to be a "daring adventure of love." (ausum caritatis) I like that. For me, it gets to Francis himself. Francis loved, was daring about how to let it play out in his life, and embraced the resulting adventure. To let ourselves be daring in our love for God and his creatures, and to embrace the adventure that we get ourselves into, that's the "striking and decisive" life that our General Minister invited us to in one of the first letters he wrote to the brothers after his election. And let's not forget that such a life is also an imitation of the Incarnation; it is surely a "daring adventure of love"--literally!-- for the Word of God to empty Himself and become one of us in order to save humanity from the inside out. I love today's Gospel (John 20:11-18) in which mourning Mary Magdalene fails to recognize Jesus. She thinks he's the gardener. But he calls her by name and then she knows it is the Lord. Now if someone who knew Jesus well in his historical life didn't recognize him right away in his new, risen, and eschatological life, what hope is there for us? I think it's the calling by name that's important. As it made the difference for Mary, so I think it makes the difference for us. For those moments when we are able to truly see the Risen Lord in the joy or suffering of another person, in the Spirit praying within us, or in the bread and wine of his Eucharist, it is only because God has called us to see in prayer. God has called us by name and invited us to notice his Risen Presence in all these things. But just as Jesus told Mary to stop "holding on" to him, so it is with our experiences of the Risen Lord. As soon as we try to grab on to these moments as if they were something of our own, the Presence of God retreats again. But this retreat is not an abandonment but an invitation for us to go deeper into the mystery of ourselves and God in prayer, and so to hear ourselves called by name at a place closer and closer to the core of our own human identity, which after all is Christ himself. What more needs to be said? Back in studies, I often used the second verse on teacher evaluations. I.e., "Professor N. had some issues with us about his own religion and about a certain Jesus who had died, but who professor N. claimed was alive." In getting ready for the Easter Vigil and Masses of Easter Sunday, I made an odd discovery. When I looked over the Masses for Easter Sunday, two things were unfamiliar: First, the renewal of baptismal vows and sprinkling in the place of the Creed. Second, the sequence to be sung before the Gospel, the Victimae paschali laudes. I didn't remember either of these things. And that's when I realized: I have never been to Mass on Easter Sunday! I've always gone to the Vigil for Easter, which after all is the principal Mass. It hasn't been until now--as a priest--that I have reason to go to Mass again during the day. So all of a sudden in the middle of Holy Saturday I have new music to learn! Then, all the priests in the house show up in the sacristy and take the little holy oil soaked cotton balls out of their little oil stocks and put them in an empty peanut butter jar. These will be used to start the new fire at the beginning of the Easter Vigil. Then each one takes new cotton balls from the bag provided, puts them into the little oil stocks, and soaks them up with newly blessed oils. Then the oil stocks go back into your briefcase, glove compartment or book bag, and you're all set to anoint the sick or baptize and confirm in danger of death. Sorry for the lack of posts this Holy Week. Apart from the stress and work of preparing the Triduum, we had two funerals yesterday and another without Mass sneaking in today before everything begins. On top of that our phone system went down on Tuesday. So it's been crazy. Nevertheless, I love this time. Every year I reflect on the grace of itinerancy that the Holy Spirit has given me; only once in my whole baptism have I been in the same place for the Easter Vigil for more than two years in a row. When I think about the places I've been for the Vigil, it puts me in awe of God and in a state of gratitude for my vocation. I remember how when I was in preschool, one of my classmates taught me this line, "Nah, I don't feel like it." It was a way to turn down a demand or offer, and very useful I found out. In a very real way, though, this part of my own early learning represents an important element of our culture: what matters is what we feel like doing. And we shouldn't have to be bothered by what we don't feel like doing. It's always been a struggle for me in prayer. If I only pray when or because I enjoy it, or worse, because like the idea of prayer, or still worse, because I like the idea of myself as a prayerful person, then my prayer is only a self-devotion. This is what it really means to take God's name in vain. That's why the "night of sense" is a real gift of grace; when the Spirit removes from us the natural interest, desire, and gratification we receive in prayer, then we find out if we really love God for God's sake alone. This isn't to say that a natural interest in prayer and devotion isn't a good thing, or that it shouldn't make us feel good. If they get us praying in the first place, they're good. But we need to notice that when God takes our interest and "feeling like it" away, this is actually a grace. When this "night of sense" happens, we have two choices. We can panic over the consolation and apparent fulfillment and good feelings we seem to have lost, and run to fill ourselves up with our drug of choice instead. This is what it means to go back to Egypt. Or we can trust in the God we cannot see, and believe that we are being led obscurely through a place where our feeling have become a desert. My first Palm Sunday as a priest, though I was awed and grateful, was one of those moments when part of me missed being a layperson. Here's why: In the Passion proclamation, I always enjoyed the part of the crowd, usually taken by the assembly. To put into my own words the condemnations and mocking of Jesus by the crowd always struck me hard as a reflection on my own sins and the inadequacy of my own ideas and images of God. This year, if Matthew's Passion is read the way the Roman rite suggests, the crowd gets to say, "let him be crucified!" and "...save yourself, if you are the Son of God, and come down from the cross!" Those are humbling words to say for a Christian, especially when we know that there are unevangelized and unconverted parts of our lives that really mean what we say. Because of the vagaries of the liturgical year, today is St. Patrick's Day here in the archdiocese of New York. The 17th, Patrick's regular day, is going to be Monday of Holy Week, when feasts of saints are not to be celebrated. Of course there's no skipping it altogether, because Patrick is the titular saint of the archdiocese. So his day has to be moved. Tomorrow, Saturday the 15th, is already taken by St. Joseph, transferred back from Spy Wednesday. Joseph, of course, gets first choice. So today, Friday the 14th, is St. Patrick's Day, which also gives the Cardinal a good excuse to commute the Friday abstinence. The City of New York, however, in its heathenism, is still having their parade on Monday. In other words we experience the holiness of God more easily than we are able to become holy ourselves. That's why it's so easy to get the impression that we are stagnant or even moving backwards in our spiritual life; the mysterious apprehension of God makes us more and more aware of our littleness and distance. But all of this is an optical illusion of the eye of the heart, as it were, because even this awareness is the work of the Holy Spirit that prays to the Father from within us. One of the brothers and I were talking about how humbling it is to go back and read evaluations of ourselves from our time of training and formation, reading anew about our faults and "growing edges." He had a great quote about the experience: "I haven't changed much, but I've grown a lot." I think that says a lot about the spiritual life. We aren't really going to change; we are who we are. I can look back at my report cards from the first grade and see that I have today the same basic strengths and deficits as I did when I was six years old. On the other hand, there is growth; we can grow into our strengths and make them into graces available for others. We can also grow into our faults, if we allow them to teach us humility and the vision to see the grace of God shining through our weakness. Let's pray in a special way for the people of Iraq today; the recently kidnapped archbishop of Mosul, Paulos Faraj Rahho, has been found dead. Hiding in the Stove, Eh? I know a friar who maintains a devotion to these three young men, and prays to them all the time. Some might think it's sad that his experience of religious life makes him identify with being bound and thrown into a furnace, but on the other hand it's not a bad comparison. But the good news is that God identifies with us in our trials and sufferings, whether as the mysterious fourth man in the furnace or as Jesus being tortured on the cross. Many people have a story about how some Catholic priest was mean to them, was dismissive, or took them lightly. Sometimes these are catastrophic events in the life of a Christian, and sometimes they drive people away from the practice of their faith. Therefore, as I've been trying to learn the trade and pick up the identity of parish priest these past six months, there's always a voice in my head saying, don't be that guy. Sometimes I walk on the edge of this fear when dealing with requests for infant baptism. If people come from an hour away and say they want to baptize their baby in our parish because of some historical connection, I usually ask them if they belong to the parish where they do live. When they admit that they haven't really thought about it since their Confirmation or wedding, I advise them to explore and join a parish where they live, and then think about baptizing their baby there. I try to do this in an encouraging and gentle way, knowing that the baptism of a new baby is a good opportunity to hook people back into their faith, but sometimes it seems like people only hear a refusal to take care of them, rather than good advice about how to bring up their child as a Christian. Sometimes I worry that all they hear is, this priest refuses to baptize my baby. 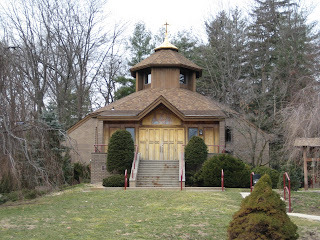 One of the treasures of living here in southern Westchester county is our local orthodox seminary, St. Vladimir's. It's become one of my favorite day off destinations. It's a great place to go for prayer and to pick up spiritual reading. The other day I bought St. Gregory the Great's Book of Pastoral Rule, published in their Popular Patristics Series. I was delighted to find something that had better sense about practical pastoral care than any contemporary book I was caused to read in my theology courses. The chapel, pictured here, is dedicated to the "three hierarchs," Basil the Great, Gregory of Nazianzus, and John Chrysostom. The great sign of the raising of Lazarus concludes Jesus' public ministry in the Gospel of John, and reveals Jesus himself as God's victory over death. My homily for this weekend is posted here. Today I was out doing some shopping at the local strip mall, and I saw a woman and a girl wearing a catholic school uniform walk into the Chinese buffet. So I thought, so much for the Friday abstinence. But then I rebuked myself, thinking, just because the kid goes to catholic school doesn't mean that they're Catholics and besides, it's perfectly possible to keep the Friday abstinence at the Chinese buffet. I thought about using my faculty to commute days of penance on them secretly, but then I decided to mind my own business. It is amazing to me how, with all of the impiety and irreligion in the Catholic Church, how seriously we take the Friday abstinence during Lent. There are bishops who ignore creepy and child abusing priests, thus incurring the curse of the Lord himself (Matthew 18:6) There are priests who conveniently forget or just ignore their promise to keep the daily Liturgy of the Hours on behalf of the Church of the world. There are religious who don't even attend the Sunday Eucharist. There are parents who take pictures of their kid on first Holy Communion day, and aren't in church again until the kid's confirmation. Some of those kids who receive Confirmation won't be seen again until they come back to get married. And don't get me started on my own sins. And yet, even the vaguest Catholics keep the Friday abstinence during Lent, doing the penance of eating fish sticks, eggplant parm wedges, plain pizza, and tuna melts. Well, as usual, I've hardly begun to live up to the Lenten practices I meant to do. This is always the time during Lent when I feel like its the last chance to actually live up to the observances I decided upon. During the first couple of weeks I think, well, I can still start this Lent well. But now it's too late for that. But now, with just 14* days of Lent left, it's always around now that I think it's my last chance to have a good Lent. I used to get much more disappointed in myself and worked up about this sort of thing. But now I understand better what Paul was talking about when he recommends to us that our faults, shortcomings, and failures are our only occasion for boasting, that whatever good there is about us might be only the power of God shining through. It reminds me of my friend who complained when a priest began the penitential rite by inviting the assembly to call to mind their "faults and failures." After Mass he told the priest that he wanted not to confess but to boast of his faults and failures (as Paul commands), but that he had actually come to Mass more for forgiveness of sins. *I know that one official answer is that Lent ends on Holy Thursday. But it only adds up to the forty days of ancient tradition if you count right up to Holy Saturday. Gary Gygax, co-inventor of Dungeons & Dragons, died this week. I've been thinking about him. For better or for worse he was a big influence in my early life prior to my serial conversions to punk rock, philosophy, and finally Christianity. Go in peace, Gary. May you make all your saving throws, never run out of somatic elements for casting fireballs, and may all your 3d6 rolls come out a natural 18. Check out the NY Times obituary here. Even the lolcats are mourning. One of the customs around here is the use of forms to certify godparents. If someone is chosen to be a godparent (or a sponsor for confirmation) they are supposed to take a form back to their own parish to be signed and sealed, in order to attest that he or she is a fully initiated Catholic and prepared to take up the role. Sometimes this is a joyous and grateful moment. Someone whom you know or at least recognize from Sunday Mass comes to the office with a piece of paper to be signed, explaining how they have been chosen to be a godparent. They can easily recount the time and place of their own sacraments of initiation, and are happy with the new ministry they are accepting. On the other hand, sometimes these are rough encounters. Sometimes the person looking for their parish priest's signature and parish seal is someone you've never seen before. And then sometimes they tell you that they either aren't confirmed or can't remember if they received the sacrament. In this case you have two choices: You can be "nice," hoping that this is a moment to hook someone back into church, and sign their form. Or you can try to explain that it doesn't make sense for someone to sponsor another Christian's initiation into Christ when they haven't done it themselves. Then you end up in a standoff in the parish office, with the visitor looking at you like you're being an unfair pain about what they see as a formality, and you looking at them as someone who is missing the fundamental nature of the whole exercise. It's just one way that the sacraments become the place where our collision with culture becomes very apparent sometimes. If people come to us for ministry, it's not a testament to our ability or holiness, but to the extremity of their misery. There's a good thought to keep this minister of the Lord humble today. Jesus comes as the revelation of the invisible God, inducing a crisis of judgment in the world: do we consent to God's revelation or harden our hearts and minds to it? Are we willing to see? My homily for this weekend is posted here.